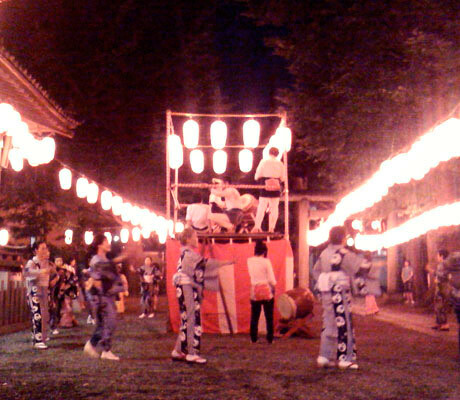 Obon is officially called Urabon, which comes from the Sanskrit word “ullambana” which means to hang up side down. This symbolizes the suffering of being in a situation where the more we eat, the hungrier we become. The more we try to avoid suffering, the more suffering we encounter. This situation also symbolizes the suffering of the world of the “Hungry Spirits” called “Gaki.” This principle is based on the Buddhist view of “the Six Worlds.” Segaki means to offer something to the Hungry Spirits. In Buddhism, all living beings drift among the Six Worlds. One’s “Karma” is determined through the Law of Cause and Effect. These Six Worlds consist of “Hell, Hungry Spirit, Animal, Asura (war), Mankind, and Heavenly Being.” Hell is the world of suffering. Hungry Spirits (Gaki) is the world of endless craving and hunger. Animal is the world of oppression. Asura is the world of conflict. Mankind is us here on earth. And Heavenly Being is pleasure. Being reborn into one of ‘these worlds depends on what we have done in the present life and also in previous lives. To understand the Six Worlds, it is helpful to think of them as six stages of emotion. Sometimes we suffer and then feel joy. Sometimes we starve and then feel angry. Whether we feel suffering or feel joy, a reason exists. Since we are related to the causes of suffering, we suffer. Since we are related to the cause of joy, we feel joy. When this relationship between cause and effect goes beyond birth and death, it is called “the Cycle of Rebirth.” This is a distinctive feature of Buddhism. The Cycle of Rebirth or “Rinne” is not just a mysterious idea. It comes from the relationship between cause and effect. You were born because there was some reason for you to be born. You are living because there is some reason for you to be alive. (C) Copyright 2019 Nichiren Shu. All rights reserved.